We used these in the Guest Gift Bag to go along with the Southern Beer chosen by my soon to be Son-n-Law. All items in bag were a perfect match just like the Newlyweds!!!!! Q:Does it come with that paper tag as per the photo? A:Yes, they will come with the tag that says "Pineapple bottle opener" as shown in the photo. Q:Is the bride and groom names are on the opener. Q:Does this product come packaged. If so how? A:The bottle opens are not packaged, they are shipped in plastic poly bags. 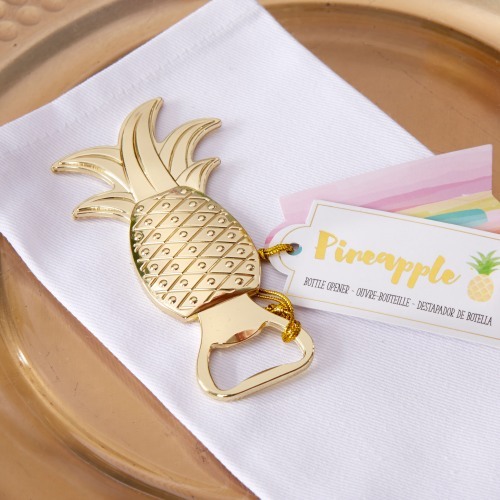 These gold pineapple bottle openers are the perfect favor for any destination or tropical themed wedding! Your guests will love receiving a favor that's both cute, practical, and can be used for many years to come. They can even be put to use before the celebration's over!